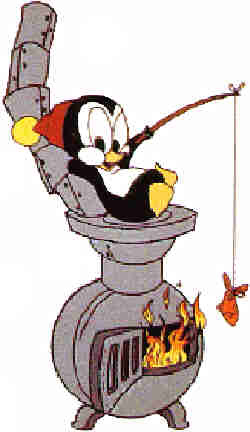 Walter Lantz's Chilly Willy who became famous for it. Willy was first seen in a cartoon titled, simply enough, Chilly Willy, released December 21, 1953. It was directed by Alex Lovy, who had gotten his start at the old Van Beuren studio (where the original Tom & Jerry series was made), and who later directed TV cartoons for Hanna-Barbera. Lovy was a competent animation director, but this particular cartoon just didn't click. Lantz liked the character, but it didn't seem to have a lot of potential. Then along came Tex Avery. Avery, who had created Daffy Duck at Warner Bros. and Droopy at MGM, came to work for the Lantz studio in 1954. Under his direction, the second Chilly Willy cartoon, I'm Cold, struck a responsive chord with audiences, and the third, The Legend of Rockabye Point (in which Avery teamed up with veteran writer Michael Maltese, whose credits range from the blackout gags of the Road Runner and Coyote series to the incredible tour-de-force of One Froggy Evening) was nominated for an Academy Award. Avery left Lantz shortly afterward, and the studio never got another Oscar nomination. But by then, Chilly Willy was well established. Dozens of cartoons followed, right up to 1972, the last year Walter Lantz cartoons were produced. Only Woody Woodpecker, the biggest star the studio ever had, was in production over a longer period or appeared in more individual cartoons. The voice actor most closely associated with him is Daws Butler, who also did Huckleberry Hound, Yogi Bear and Loopy de Loop. In comic books, Willy never really broke the ice. He headlined a total of nine issues of Dell's Four Color Comics, published between 1956 and '62. Other than that, he was seen only in Woody Woodpecker's back pages. Chilly Willy still turns up from time to time on children's television, usually in out-of-the-way time slots, along with Buzz Buzzard, Wally Walrus, Andy Panda, and the rest of the Walter Lantz crew. He also appeared, with new animation, as a back segment of the Fox TV network's 1999 Woody Woodpecker show (as did a formerly unanimated 1960s character called Space Mouse). And the great motivating force of his character is understood by any kid who ever accidentally kicked the blanket off in the middle of the night. Text ©2000-08 Donald D. Markstein. Art © Walter Lantz Studio.